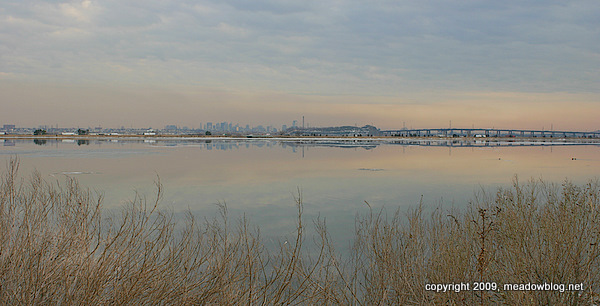 We took this shot at DeKorte this afternoon from the Lyndhurst Nature Preserve, with the recently thawed tidal impoundment as smooth as glass. In honor of Groundhog's Day, here's a video we did last June, before the blog was really up and running. We will check on Lyndhurst Lindy and report any activity. Note: We realize that it is a bad idea to take hang out in front of birds' nests or mammals' dens in an effort to get a family portrait. The animals feel threatened and cannot escape. For this video, we used a trick we learned minutes earlier from a professional cameraman: You put the video-cam on a tripod not too far from entrance, hit "record," and walk away. 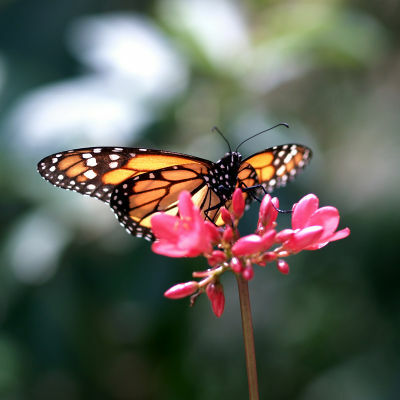 A majestic monarch butterfly, egrets caught in mid-flight and peaceful coastline scenes are among the works by Rutherford resident Fred Dammers on display this month at the New Jersey Meadowlands Commission’s (NJMC) Flyway Gallery in the Meadowlands Environment Center. The exhibit, titled “A Personal Perspective,” runs from Feb. 2 through Feb. 27. Dammers, a lifelong Rutherford resident and frequent visitor to DeKorte Park – the home of the Flyway Gallery – uses traditional and digital photography to capture stunning views of nature and cityscapes. The NJMC is proud to host his first public exhibit. The NJMC created the Flyway Gallery to help foster the cultural identity of the Meadowlands District by providing a space to showcase the talent of local artists. The gallery is open from 9 a.m. to 5 p.m. Monday through Friday and 10 a.m. to 3 p.m. Saturday and Sunday. Admission is free. For information, please call (201) 460-8300 or visit ww.njmeadowlands.gov/ec. Click "Continue reading …" to see two more of Fred Dammers' photos.